Lit by a colour change LED, My Little Pony favourite Rainbow Dash becomes a rainbow herself as she shines with a colour change light show! 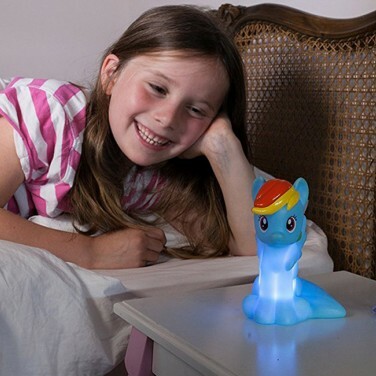 Just the right size for little ones to handle, Rainbow Dash remains cool to the touch and is battery operated so that she can accompany little ones on night time adventures including trips to the loo and sleepovers at Grandma's providing reassurance at night. 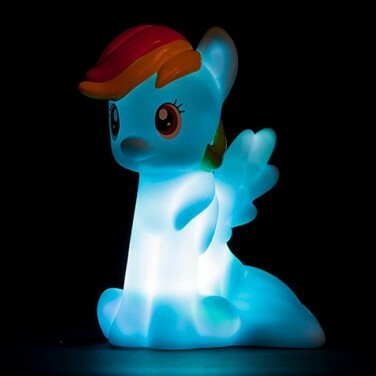 With a simple on/off function, simply flick the switch and Rainbow Dash will shine with captivating colour change light night after night.